First of all the Medifast diet is clinically proven. The brand is recommended by over 20,000 doctors since 1980 for helping people to lose weight. When you look at the Medifast website you will see that the site itself is talking about professionalism and experience. What can Medifast diet do for you? You can lose 2-5 lbs per week for the first 2 weeks and 1-2 lbs per week thereafter, which is considered healthy by doctors and dieticians. They will deliver right to your door complete, well balanced, good looking and tasty meals and an easy to follow diet plan. You don’t need to shop or cook anything more for the diet. If you select Medifast 5 & 1 weight loss program you will never feel hungry, because you eat 6 times a day. I have heard some people say that you will gain back weight with Medifast when you stop. Let’s think realistic. If you return to your old eating habits, you will gain back weight no matter of the diet you have used. If you stick for at least one month to the Medifast diet foods and follow the plan strictly, it’s almost impossible to return your old way of life. What if I already tried several unsuccessful diets? Medifast will also help you lose weight, especially if you already have tried different diets and products with no success. Missing your chance with the Medifast diet you risk making other mistakes. At the end you will lose motivation and will have to deal with the fat on your body. Food Supplements: Homestyle Chili, Oatmeals: (Apple Cinnamon, French Vanilla Berry, Maple Brown Sugar), Hot Cocoa; Chicken Noodle Soup, Minestrone Soup, Peach Pro Tea, Chocolate Pudding. Supplement Bars: Chocolate Divine, Crunchy Lemon, Oatmeal Raisin, Peanut Butter, Chocolate Mint, Double Berry. Lean Meat: Skinless chicken or turkey breast, Fish, including shellfish, tinned tuna or salmon. Lean cuts of beef, pork, or lamb. Grill, bake, or poach. Condiments allowed. For men there should be 6-7oz of lean meat, for women 4-5oz. Green Salad: 1-2 cups of salad greens, up to 1/4 cup raw vegetables. Cooked Vegetables: 1-1 1/2 cups of fibrous vegetables instead of salad. Become a V.I.P. 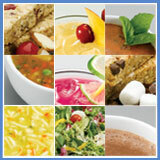 Member and get 2 weeks of meals FREE! Use JoinNow at checkout! Medifast 2 Week Starter Kit costs $199.20. The clear navigation leads you directly to choose your meal plan. One week, two weeks, 4 weeks, 2 meals, 5 meals + 1, you name it. You will also find a different person with before and after pictures on each page. These are professional pictures of real people that have lost real pounds with Medifast diet. I was pleasantly surprised to see a page where you can download several PDFs (Guides, Meal Plans, Weight Loss Tips, Sample Menus and many more). They also have a BMI calculator and a helpful forum where you can share your story or experience. Believe me you won’t be alone on your weight loss journey – get connected with other dieters through their weight loss groups, forums, blogs, articles and tips.